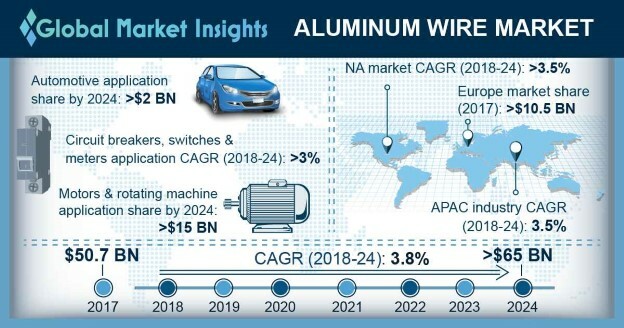 Aluminum Wire Market size is set to surpass USD 65 billion by 2024; according to a new research report by Global Market Insights, Inc. Growing consumer demand towards lightweight automobile vehicles may drive aluminum wire market demand. Superior properties which include light weight, high strength and corrosion resistance may cater to construction and electrical industries, thus propelling industry growth over the forecast timeframe. Aluminum wire are utilized in various home electrical appliances, switches, circuit breakers and motors owing to its light weight, corrosion resistance and retention of temperature even at low temperatures properties. The products are used in electrical products as they are lighter than other material, it also reduces corona an electric discharge which is associated with high power transmission and its excessive heating do not separate the electrical fixtures and connections, thus increasing the industry demand." Nomex insulated rectangular & round aluminum wire market demand may surpass consumption at over 1.7 million tons by 2024. The product is compatible with all kinds of varnish, sticky compatible mixture, transformer fluids and lubricants owing to its tera resistance, moisture resistance and abrasion resistance properties. These products can withstand temperature over 200-degree Celsius owing to its strong mechanical properties and are used in transformers to cope up with high load expansion which in turn enhances the product demand. Mica insulated aluminum wire market size may exceed USD 4.5 billion at the end of projected timespan. These wires are one of the most suitable insulating material owing to its corona and thermal resistance properties. This wire is mainly applied in high voltage rotating machine owing to its superior resistance and therefore it is widely used in inverter driven motors, thereby driving the product demand. Aluminum wire market size from transformer applications may register gains at over 3.5% by 2024. Aluminium wound transformer are lighter in weight than copper ones and expands nearly one-third under changing temperature. These wires have a larger cross-sectional area which is 66% and is responsible to produce acceptable hot-spot gradients regardless of winding material, which in turn enhances market demand. Aluminum wire market size from shipping applications was estimated at USD 785 million in 2017. They are utilized for marine surroundings, fixed and floating offshore amenities. They are used for communication, indicating, regulating, electronic and similar circuits where multiple conductors are needed, thereby stimulating product demand. U.S. aluminum wire market demand may witness gains at over 3.5% over the forecast period. Increasing construction spending on single family homes and commercial construction projects may boost the product demand. These products are installed in residential application for lower voltage service feeders from the utility to the building, thereby stimulating the regional demand. China aluminium wire market size is valued to surpass USD 15.5 billion by 2024. Growing automotive production in the region which favors this material for its light-weight nature and is generally applied in gauge to reduce the weight of components and maintains high reliability, thus providing stimulus to the industry growth. Germany aluminium wire market demand was valued at over USD 935 million in 2017. Increasing automobile sector with the usage of these wires which comprises of superior properties like lightweight and high strength which tends to reduce vehicle weight, thereby increasing product demand. Norsk Hydro, Novametal Group, Axon Cable, REA Wires and Vimlesh Industries are key industrial players in aluminium wire market. Strong R&D spending and new product launches may enhance the product portfolio, thereby stimulating the industry growth.